Grimshade is a party-based role-playing game inspired by JRPG of the 90s, featuring a tactical turn-based combat system and a grim story of war and personal choices. Mostly Positive (49) - 79% of the 49 user reviews for this game are positive. In this update, we've optimised the performance of in-game locations and battle scenes, improved the English localisation and implemented our usual bunch of minor fixes. Numerous fixes of spelling and punctuation errors in the English localisation. Optimised performance at Arthu's Ruins and Arthu's Marshes battle scenes. Performance improvements in all locations and battle scenes. Added two new tips on loading screens. Minor fixes in descriptions of "On the sacred paths" quest. You can't complete "On the sacred paths" quest multiple times now. Fixed the name and the portrait in a final dialogue between Alister and Ruby. The second and third Disks of Times got the short description. Some of Marsh's mushrooms had mixed-up phrases. Now it should work correctly. Added new dialogue for the "Electricity or life" quest. Added a clue for making the Black Water. Fixed several NPCs. Those who remain silent can talk now, those who speak simultaneously can talk with you correctly. Add the localisation for Ruby's Invisible status. During the Escape from Brann quest, Lux and Warwaroo dialogues activated on a distance and could give you Medical supplies twice. Now it should work correctly. The second-floor Spicy Wind's chest can change its content depending on a stage of your quest. Changes the final of Moo'shoe war quest. You won't meet Kabba and Stas after the completion. Removed the cutscene at the Abandoned House, which showed you a BooBoos running out the house. 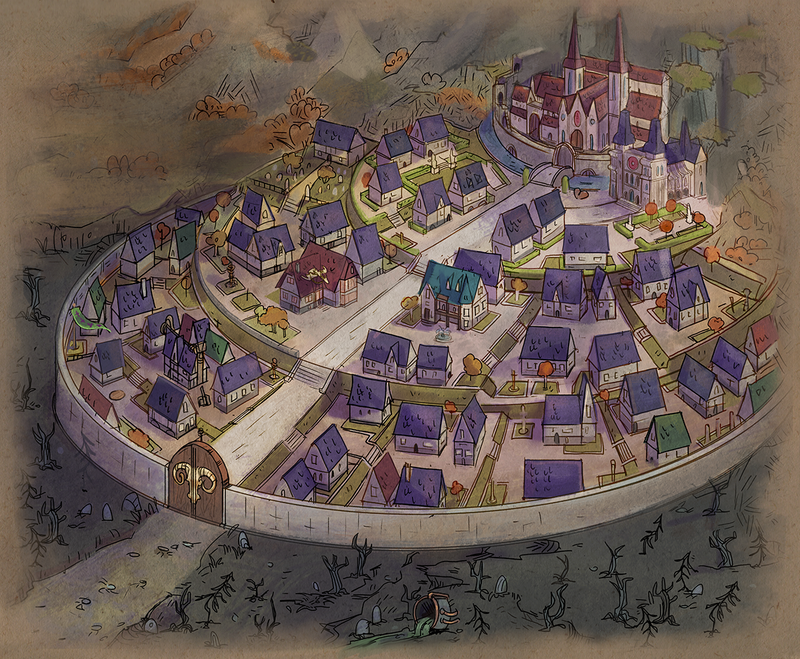 During the Devoured attack's, you will meet them on the Upper Brann district AND on the Streets of All Trades. Sillie got a new animation of taking the damage while she is in the knockdown. Some visual improvements on Gukah's shot. Added new Lilypond stub's animations. Took away a surgical saw from Gasan. Private Ponch got a unique appearance. Increase the cost of Charlie's mark. Removed the Umbrage Weald's theme from the first cinematic background. If you face any issues, please, report it via Discussions or our Discord. We're eager to listen to your comments and work together with you on making Grimshade even better! Thank you for your patience and for playing Grimshade. Please, write an honest review of the game. Your support will help us to spread the word about Grimshade and engage more players! In this late-announced patch, we've set up correctly our difficulty levels, fixed some old issues and brought our usual lots of minor fixes and updates. Difficulty levels are adjusted and corrected, bringing you Difficult, Normal and Easy modes. You may explore their descriptions while setting a new profile. Moreover, we've added a checkbox named Iron Man. If you're going to complete the "A man can die but once" achievement, this setting will restart a battle anytime your hero is dead. POI are set on their spots and highlighted in a specific moment. Fixed a bug which turns out the battle music and sometimes triggers the playing a few melodies at one time. Reworked the balance of encounters with Devoured. Now it works as it should. Fixed minor issues in Tutorials related to Special skills. Added some descriptions for characters Special skills. Fixed the bug which shows you an incorrect description of Silver Enphimeriscusul quest. Some minor dialogue and localisation issues for the Silver Enphimeriscusul quest. Fixed the bug allowing you to buy some items from Marshes' NPCs for a lower price. Moo'shoes near the Kurkan Pit may talk with you now. Fixed the name of NPC Bluebella. Lilipond's Cutscene about Charlie's youth should work correctly now. You may trade with Gobbak after the Umbrages attack now. Gathering pots of flowers isn't available now until you get the On the sacred paths quest. Some players couldn't get the pie from Bartholomey in Gardener quest. Now it should work correctly. Now you may talk with drunk Sillie during the Welcome to Lilipond quest. Fixed the issue with Moo'Shoes during the Gobbak talk. Fixed the bug which causes the POI blinking. Added notification of unsuitable symbols used while saving the game. Some visual changes in Spicy Wind tavern. New tips on loading screens. By popular request from our players, we’ve changed the map of Brann in patch v.1.0.8. Now it is perfectly compliant with locations, so you can easily get the lay of the land. We hope that you will never be lost in the Lower Brann again with it! By the way, what do you think about the Arthur Marshes map? Should we change it as well, or is it good as it is? If you face any issues, please, report it via Discussions or our Discord channel. We're eager to listen to your comments and work together with you on making Grimshade even better! Thank you for your patience and for playing Grimshade. Grimshade tells the story of the company of heroes, by a twist of fate involved in the cycle of events unfolding in the world of Ree'fah. Numerous dreadful monsters infested the forest around the city of Brann and high walls could no longer protect residents from the attacks. The menacing army of the neighbouring kingdom suddenly landed on the outskirts of the city, wreaking havoc. There is no hope for salvation — the strength of the defenders is running low, but the King and his loyal Champions had vanished. Complex tactical turn-based battles: a variety of elaborate enemies won't let you complete the whole game using a single tactic or invincible team build. Choose wisely the squad you take in a fight — proper positioning and awareness are essential to your success struggling against powerful foes. The vivid and diverse world of Ree'fah: immerse yourself in the hand-painted fantasy universe of Grimshade and discover an impressive history in more than 20 hours of an exciting journey. Additional Notes: Recommended screen resolution - 1920x1080.